Myth 1.: Little or no methane is venting in the Arctic, so there's nothing to worry about. Reality 1.: Methane is venting in the Arctic, but it can be hard to detect how much and where it originated from, in terms of source and location. Some satellites circle around Earth above the equator, making that they watch the Arctic through a thicker layer of atmosphere, which can mask detection of methane in the Arctic. Furthermore, since methane can quickly rise in the atmosphere and move with the wind, releases could be missed by flask and in situ measurements at surface levels unless measurements happen to be taken in close proximity to the point of release. Too little measuring is taking place and more should be done to monitor this. Below a combination of images showing methane levels over five years (2009 on the left, to 2013 on the right), each time for the same period (January 21-31) - images by Dr. Leonid Yurganov. The big worry is what will happen as temperatures rise even further. Warming due to higher concentrations of greenhouse gases in the atmosphere is occurring much more vigorously in the Arctic than elsewhere on Earth. Waiting for further proof that methane is increasingly venting in the Arctic carries the risk that it will be too late to do much to reverse the process by the time such research is completed. 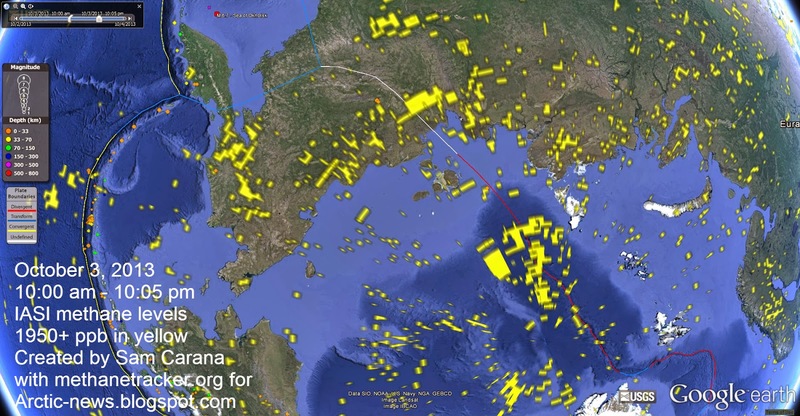 Methane already appears to be venting from the seabed of the Arctic Ocean (see image below). Moreover, there is a wealth of evidence from scientists such as Igor Semiletov and Natalia Shakhova who have - year after year - been taking measurements in the East Siberian Arctic Shelf, complete with first-hand reports that methane plumes have been detected. "We've found continuous, powerful and impressive seeping structures more than 1,000 metres in diameter. In a very small area, less than 10,000 square miles, we have counted more than 100 fountains, or torch-like structures, bubbling through the water column and injected directly into the atmosphere from the seabed," Dr Semiletov said, "We carried out checks at about 115 stationary points and discovered methane fields of a fantastic scale - I think on a scale not seen before. Some of the plumes were a kilometre or more wide and the emissions went directly into the atmosphere - the concentration was a hundred times higher than normal." 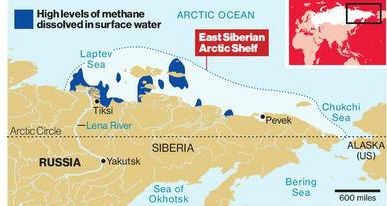 - Vast methane 'plumes' seen in Arctic ocean as sea ice retreats, by Steve Connor in The Independent, December 13, 2011. 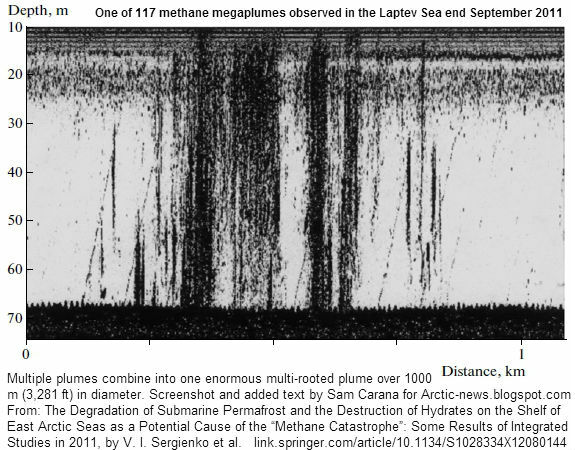 The image below shows a cluster of methane plumes, over one km in diameter, that appeared in the Laptev Sea end September 2011. 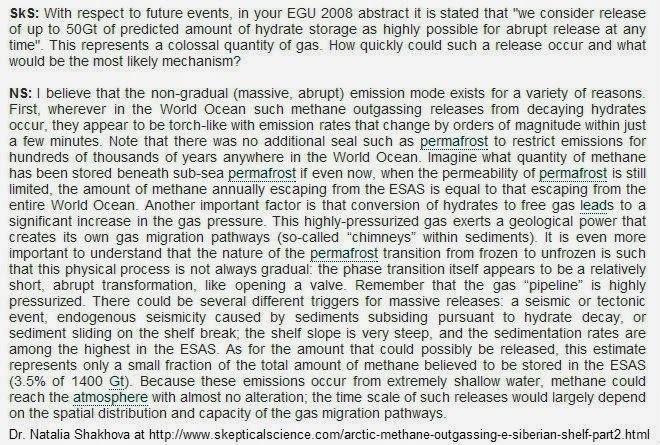 The image is part of a paper on the unfolding "Methane Catastrophe". 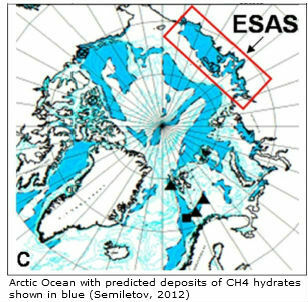 Myth 2.: Hydrates cannot exist in water as shallow as in the East Siberian Arctic Shelf; therefore, no methane could be venting there. Myth 3.: Global warming heats up the water in the Arctic from above, where there are no hydrates. It will take hundreds of years for this heat to reach the bottom of the sea. Reality 3.: While the sun does heat up the waters in the East Siberian Arctic Shelf (ESAS) from above, the waters are quite shallow. Additionally, warmer water enters the Arctic from the Atlantic and Pacific Oceans, and from rivers in Siberia. As the sea ice disappears, more open water allows more storms to develop that mix the waters, while tidal pressure differences will also be more pronounced. Myth 4.: Even if heat did reach the seabed, it would take hundreds of years for the heat to penetrate the sediment. Reality 4.: It can indeed take a long time for heat to propagate down the sediment. But it can also occur very rapidly, when heat is transferred down fluids in cracks and openings in the rock and sediment, called pingos, which were formed by local accumulation of hydrate (ice) below the sediment surface in the past, and by methane migrating upwards through conduits. 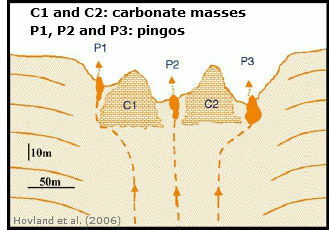 Pingos and similar structures can link to deep-rooted plumbing systems that allow thermogenic fluid migration from several-kilometers-deep sedimentary basins. Myth 5.: Even if methane did escape from the seabed, most of it would be oxidized in the water - like in the Deepwater Horizon event - before reaching the atmosphere. In the Arctic, low temperatures mean there are less bacteria that need more time to break down the methane. In other places, currents may bring bacteria back to the location of the methane plume repeatedly. In the Arctic, many currents are long, so once bacteria flow away from the location of the plume, they may have been driven out of the Arctic Ocean or may return only after a long time, i.e. too long to survive in Arctic waters which are cold and often ice-covered, so a lot of time little or no sunshine penetrates the waters. In the Arctic, the danger is much larger that methane releases will overwhelm the capacity of bacteria to break it down in the water. In case of large abrupt releases, the danger is that much of the methane will reach the atmosphere unaffected. Myth 6.: Methane has a short lifetime in the atmosphere. It will be broken down in a few years, so we don't have to worry about it. Reality 6.: According to the IPCC (AR5, 2013), the perturbation lifetime for methane is 12.4 years. This is an upgrade from the 12 years stated in IPCC AR4 (2007). The IPCC figures do take into account the fact that methane extends its own lifetime by depleting hydroxyl. However, this is an average figure. Large abrupt releases will overwhelm the system, especially in the Arctic where there is already very little hydroxyl present. Large emissions extend the lifetime of all the methane that is present in the atmosphere, especially locally, as in case of large abrupt release in the Arctic. Hydroxyl levels in the Arctic are very low. Methane can remain active in the Arctic for decades at a very high warming potential, while the resulting summer warming (when the sun doesn't set) is likely to keep triggering further methane releases in the Arctic. Myth 7.: Methane is only 20 or 21 times as potent as carbon dioxide. Among others, the EPA has been spreading this myth for many years. Below is a screenshot. 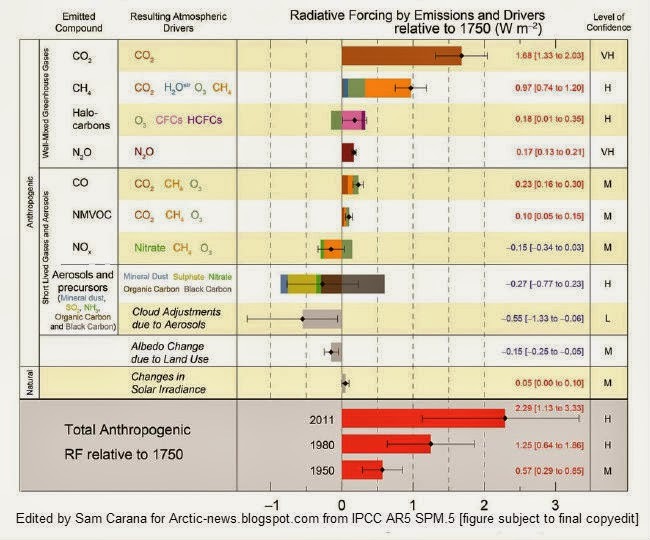 Reality 7.: Recent IPCC figures for methane's Global Warming Potential (GWP) are in the table below. 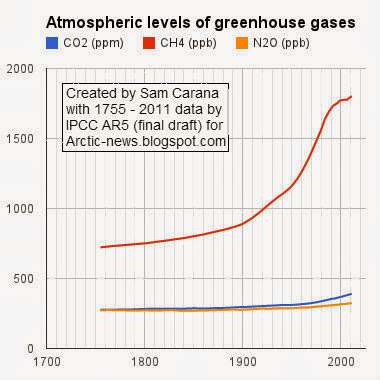 Earlier IPCC figures did not reflect oxidation of methane to carbon dioxide, which contributes to the CO2 burden. Furthermore, methane increases its own lifetime through OH depletion, enhances stratospheric water vapor and increases tropospheric ozone (both potent greenhouse gases). In 2009, Shindell and others further improved methane's GWP by including both direct and indirect effects, increasing methane's GWP to 105 over 20 years. Unlike CO2, methane's GWP does rise as more of it is released. Responses by ecosystems could increase methane's warming potential even further, especially in the Arctic where methane releases could accelerate the decline of snow and ice cover and trigger further methane releases, as also described at The potential impact of large abrupt release of methane in the Arctic. It's also worth noting that the IPCC now gives methane a Radiative Forcing of 0.97 W/m2 (up from 48 W/m2 in 2007), as illustrated by the image below. Myth 8.: Not much methane is stored in the Arctic; releases would be low and gradual. That's quite an understatement, if not a deliberate downplaying of the danger by the IPCC. Natalia Shakhova et al. (2008) consider release of up to 50 Gt of predicted amount of hydrate storage as highly possible for abrupt release at any time. By comparison, the total amount of methane currently in the atmosphere is about 5 Gt. Myth 9.: Methane levels have not risen (much) over the past few years. Reality: Historically, atmospheric levels of methane (CH4) have risen much faster than those of carbon dioxide (CO2) and nitrous oxide (N2O), as illustrated by the image on the right. Yes, the (rapid) rise of methane did 'slow down' for a few years from about 2000, but then picked up its pace again. This temperary 'slow-down' is often attributed to stronger energy-related emission controls in the late 2000s, in sectors such as fossil fuel drilling and distribution, and its use in transport and electricity-generation. However, levels have risen strongly again over the past few years. Point remains, as said, that methane levels have historically risen even faster than levels of carbon dioxide. While this historic rapid rise of methane levels is very worrying, future levels may rise even more rapidly, due to large abrupt releases of methane from the Arctic seabed. There was a study recently of the methane releases along the western edge of the continental U.S. Seems to roughly coincide with the area inland of the former range of the coastal redwoods. Interested if anyone has looked at not just the water but the carbon uptake by those carbon sequestering trees.